The Hmong were strong supporters of the United States during the Vietnam war and were in grave danger both during and after the war. The war and its aftermath forced many Hmong into refugee camps in Thailand until they could immigrate to the United States and other supportive countries, which involved a long period of readjustment for them from their simple close-knit traditional life. Their folk art including their highly skilled needlework has helped them keep their identity and traditions. Hmong history of needlework is a combination of both ancient traditions as well as recent adaptations, started during those long years in the refugee camps, as a way to earn income, by selling these pieces to tourists. Fine needlework has always been a source of great pride to Hmong women. Possibly the most difficult of all was the reverse appliqué called "Pa nDau" (sometimes spelled "paj ntaub") meaning flower cloth. Making one of these lovely appliquéd pieces is painstaking and takes years of practice to develop the skills for it. Perhaps the best known form of Hmong needle art is "Paj Ntaub Tib Neeg" also called "story cloth". The Whispering Cloth and Dia's Story Cloth are two such representations of the Paj Ntaub Tib Neeg, and the newly adapted tradition of preserving the memories of their life and their culture, through this art form. The story in the book starts with this story cloth arriving in the mail, from Dia's Uncle and Aunt from a refugee camp in Thailand. But the story of Dia and the people of hmong starts long before that. To a time when the Hmong, became a displaced people, having lost their homes, and living out most of their lives in refugee camps, and later on, adapting to a whole new way of life in the United States. They took to needlework, to pass the long hours in the camps and also as a means of income. In the introduction, Dia tells us a few facts about the embroidery. That it is all hand embroidered. That even men would partake in the needlework to pass the time. That it takes many months to complete a story cloth. That no patterns are used, no measurements made. And everything is done by eye, and it comes out perfectly everytime! 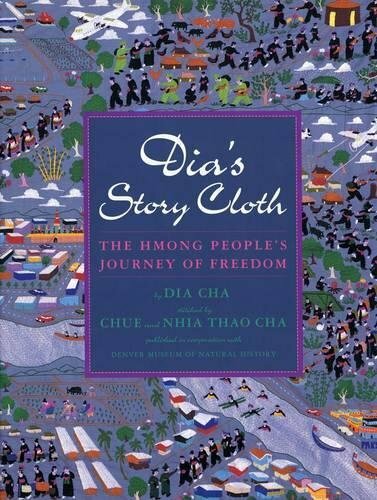 Through the book, Dia tells us about they Hmong, and their way of life, when there was still peace. She tells us a little bit about her childhood and her chores. And how everything changed one day. The story is vivid, through the painstaking embroidery pictured on every page, adding the graphic imprint to this story of sorrow and loss, and also to the spirit of survival and preservation of a way of life through a traditional art form. The Whipering Cloth is based on the life of a little girl that the author watched, while visiting a refugee camp in Thailand. It may not correspond to her young life in every inimitable detail, but it is the story of many of the Hmong people. Mai lives in the refugee camp with her grandmother. She loves to sit at the Widows' store and listen to the older women as they talked, while working on thier pa'ndau, embroidered story cloths. All her cousins have already emigrated to the US and she is one of those who have been left behind. She, and her grandmothers and many others. Her grandmother ropes her in to fill in some of the simpler stitches, short and straight, loops, strands, dots. Until very soon, it becomes obvious that Mai has a natural talent for it. Much like her mother, who is no more. Mai gains in skill with the summer, and one day she is consumed with the desire to stitch a whole pa'ndau by herself, to sell to the traders. But her grandmother tells her very firmly, that if you do not have a story of your own, you are not ready to do a pa'ndau. For days, Mai tries to think of a story to stitch. But all the good ones are already whispering around her. But a sensitive event of a restless night from her aching hands, is what finally gives her the story for her very own pa'ndau. Feeling very homesick and missing her parents desperately, she decides to tell the story of her own life. She labors over it and one day it is done. And she asks her Grandma how much it will be worth to the traders. Her wise grandmother tosses the question back at her. And from the depths of her very own heart, and from the memories lodged deep within every stitch of her pa'ndau, Mai finally realises, that what she has is not worth anything at all. Because the pa'ndau is not for sale. This sensitive, aching tale is rendered in soft watercolor paintings and captures life at the refugee camp very poignantly. In addition to showing all the promise of life that comes from the creation of beautiful embroidery, from scratch. Particularly sensitive is the soft sketch of Mai lying snugly asleep, in between her mother and father, a whisper of the life that could not be, making us ache for her loss and for her dreams, and appreciating the story of her people and this tradition of telling it through the intricate skill of their bare hands, all the more! "Particularly sensitive is the soft sketch of Mai lying snugly asleep, in between her mother and father, a whisper of the life that could not be". - That was sensitively written. SSS : Yes, the very idea of embroidery being eternal is powerful. I loved reading and finding out more about the Hmong. 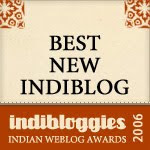 Tharini, ever since you gave away a two liner about these books (in the mail to P and me), I have been so curious to read your reviews. What a wonderful way of preserving both memories and tradition. Loved the historical perspective, Tharini. "But her grandmother tells her very firmly, that if you do not have a story of your own, you are not ready to do a pa'ndau." Touched a chord somewhere. Thanks for this pick, T.
Always had very special appreciation for handmade. Thanks for introducing the Hmong needle craft to me. Two stories on cloth and needlecraft about a very special group of people. Thanks, T for bringing the story of Hmongs to ST. What a transition it must have been from their native land to refugee camps to countries of asylum? sigh...their folkart seems to have been sustained, thankfully! Wondering if the mung bean (our moong dhal) has any connection with the hmong people? As in, if they cultivated them as crops in China? Just curious. Wow..speechless here T. What a journey it was..how you neatly introduced them and almost made us feel one among them, towards the end! Amazing group of people. I particularly liked this "if you do not have a story of your own, you are not ready to do a pa'ndau" - how genuinely their lives, traditions and art are intertwined. I was really touched by the life of the Hmong, and that the word 'Hmong' literally means freedom, though, if you read some more of the literature on the net, seems another question of debate. I would love to embroider the story of my life, after reading these books. I am speechless, T, thanks for the amazing picks! And, thanks for introducing Hmong needlecraft to me. Did you share them with Winkie? Very touching. And very informative - did not know so much about the Hmong. I wish I were a child now. Ready to learn all these things through these wonderful books.